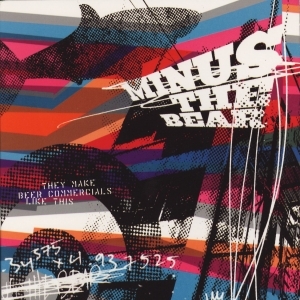 Minus The Bear – They Make Beer Commercials Like This EP | NoCoda. What It Sounds Like: Dynamic-shifting indie rock, half of which leans toward rhythms you can dance to, and the other half towards straight alternative rock with a plethora of various guitar tones and memorable hooks. It’s funny to dive into the past. The first time I saw these guys, it was at Rocketown back in 2005, with the lineup also consisting of Gratitude, Straylight Run, and The Working Title. Holy two thousand and five, yes it was, yes it was. It was a great lineup, but out of all those bands, only one still exists today, and have continued to release new music that is actually still selling on some level. Even more crazy, they have had all the same members (save for replacing their keys player in 2006) ever since they got together in 2001. Bands replace members every other record, so 12 years without a major fallout is quite impressive; they have to be doing something right. I will admit: I do think Minus The Bear is unique with their twist on the indie rock scene. I tried to explain it a little further up top, but it’s something to be heard to get a full realization. This six-track EP is a great introduction to the band, and lead-off track Fine + 2 PTS is an excellent first dose. …so sings Jake Snider in his unique vocal tone. It’ll get you dancing and singing the hook over and over in your head. Jake’s interesting – he looks like a homeless Eddie Vedder and sounds completely effortless and board when he sings some of these songs, but nothing about his delivery sounds bland or off-key. You just don’t see the tight melodies coming out of the mouth of a guy who looks like he does. It’s different, and I enjoy it. Moving forward, I’m Totally Not Down With Rob’s Alien has a haunting trickle-up guitar line that slowly burns up into the atmosphere – it’s certainly a song to transport you from one place to another musically. Floating among the stars, discovering new galaxies – opening your eyes for the first time. Self-actualization? I’m getting too complex here. I should probably simply leave it at…I just like the song. The echoing guitars and dynamic shifts (which I have already stated) are what make this EP a solid listen. Closer Pony Up! switches between an underwater aquatic guitar tone, some acoustic picking, and an all out electric shred, and none of it seems forced. Throwing all that together and accomplishing something that doesn’t sound like a mess is a win in my book. I admit it. I almost choked when I saw what counted as diving into the past. Not because you’re wrong, it’s just a harmless difference of perspective. In any event, I was surprised by the complexity of the guitar. The connection with that mathcore band Botch made it all make sense. Diving into the past, as in – looking back to my Freshman year of college, which seems like a long long time ago in the past. Also, I willingly admit that I did not know about the connection to Botch – that does make things much clearer. Good thoughts!